Pyrus elaeagnifolia Kotschyana is an unusual and relatively rare upright silver pear tree with a lovely slender habit. The pretty silver-grey leaves are complimented with an abundance of wildlife-friendly small white flowers in spring. Reaching just 5 x 3 metres in 20 years, the slender upright form of Kotschyana makes it a great choice for practically any sized garden. 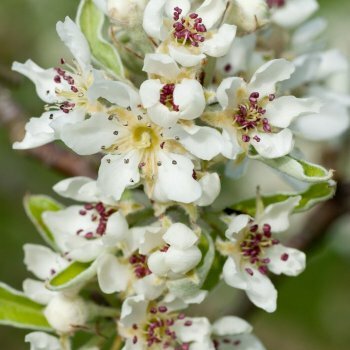 This silver pear tree grows well in most soils and unlike some ornamental Pyrus varieties, it is suited to either a sunny or partially shaded site. Weeping silver pear trees should be pruned during the dormant season, from autumn to early spring. Pruning requirements are minimal, focussing on only damaged or awkwardly placed branches. When pruning an ornamental pear tree you should aim for a balanced all round effect. For the first several years, prune the lower branches to maintain a clear stem. Even weeping varieties need to have a clear stem to allow room for their pendulous branches.